Tube buffer Musical Fidelity X-10v3. Introduced for the first time in year 2004. Successor of the more popular X-10D. Connecting it, in between the source (ex. CD player) and the amplifier, makes the sound more tube-like. Using it between pre- / power amp solves the problem of impedance mismatch, if you suffer one. Loop output makes it possible to directly compare the sound with / without the buffer. Very nice feature, enjoyed playing with it. Furthermore, typical MF, simple but well finished casework. Solid chassis, fully made out of metal, plus a thick, brushed aluminum face plate. Aesthetically, the X-10v3 is a perfect match for the X-DACv3 digital to analogue converter and the X-PSUv3 power supply. 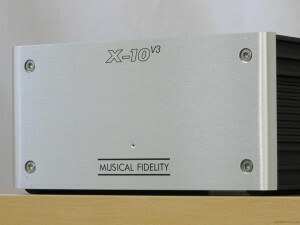 Can be also matched with a X-CANv3 headphone amplifier, X-LPSv3 phono stage or last but not least X-Rayv3 CD player. Tube output stage on 2 Philips ECG USA tubes (muVista). A legend returns! Musical Fidelity sold almost 50,000 of their original X-10 Tube Buffer Stage and has finally brought it back to life. The new X-10v3 is based on the Musical Fidelity exclusive Mu-Vista (kW) tubes and is guaranteed to add the magic of tubes to any system without adding any significant noise or distortion. The new Mu-Vista tube is Musical Fidelity’s highest performance tube to date. It’s more linear and quieter, with better performance capabilities than either their highly regarded Nu-Vista or Tri-Vista tubes. The X-10v3 is a tube output stage that can be added to any system; perfect behind any digital player, in a tape monitor loop or between your preamp and amp. Turn your CD or any other affordable digital player into the tube-hybrid player of your dreams. Add it between your amp and preamp or into a processor or tape loop and hear every single source component come to life in a spectacular way. Once in place, you will hear an added level of richness, warmth and musicality previously attainable only with a tremendous investment in world-class tube gear. The $399 Musical Fidelity X-10v3 Tube Buffer Stage will be a very limited manufacturing run, so audition one in your system before they are history! Musical Fidelity’s latest discovery, the 6112, is an ultra high performance twin triode that we call the mu-Vista. Originally, it was used by the US military for crucial low noise guidance and other missile functions. It is incredibly rugged and immune from microphony and other extraneous effects. Also, and we hope this attribute is never needed; it’s immune from electro-magnetic pulse (EMP) which occurs when a nuclear bomb explodes! As you would expect, the mu-Vista is super tough, super quiet, ultra reliable, incredibly linear and absolutely predictable. Musical Fidelity has not had a single Tri-Vistor 5703 tube fail anywhere in the world in any of their Tri-Vista products. Our tests show that the mu-Vista has similar levels of reliability, and why not? The tubes have been purchased direct from the US military and are genuine milspec, mil usage parts. As far as we know, they have bought the vast majority of the world’s stock of the amazing mu-Vista. It will form the basis of a number of limited edition products. On the output of a CD player. In the tape loop of an integrated amplifier. Between a pre and power amp. High input impedance – Does not offer any loading to the source CD player and as a result it gives its best possible performance. Low output impedance – Drives any amplifier easily and ensures virtually perfect linearity. Uses exclusive mu-vista (6112) mil-spec mil-usage tube- Excellent technical performance, incredible longevity – great sound. Low noise, low distortion, huge overload margin and wide bandwidth – Extremely clean sound with huge dynamic range. Limited edition – Not many other people will have one of these babies.